Hamburgers and hot dogs. Hot dogs and hamburgers. That is the basic make up of nearly every backyard barbecue in America. There might be some turkey burgers (usually in the name of “health”), maybe the occasional tofu kebab for the resident vegan, and some steak or ribs if someone is feeling ambitious. But that is about it. The protein you likely won’t find on the grill? Goat. You can blame Ye Olde England for the lack of goat currently on your grill. It goes back to medieval times, says Wheltor, when England was exporting wool to mainland Europe. Because that industry was so successful, England became focused on sheep farming to increase wool production, leaving goats behind. But that is starting to change. It might seem like goat is more widely available in other countries, particularly those in the East, but the animal is growing in popularity in the US and the UK. He says in the last year alone, the US imported $270 million worth of goat meat. “The number of goats slaughtered has doubled every 10 years for the past three decades,” says Wheltor, citing figures from the USDA. For those who can’t stomach raw goat, he also recommends throwing it on the barbecue. “Is there a bad way to bbq goat? I don't think so!,” says Wheltor. He recommends borrowing from the the Argentinian school of “asado” cooking and throwing a whole goat on a fire if you have a crowd. Looking for something simpler? 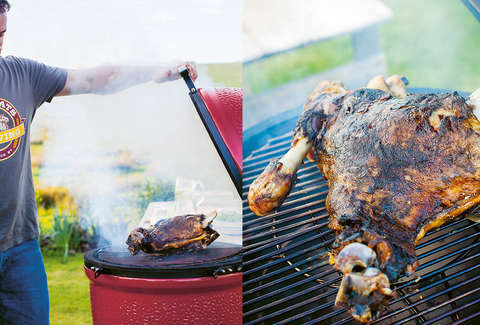 Wheltor recommends putting a goat shoulder in a Big Green Egg for about five hours. “You get this smokey, sticky, sweet pulled meat that makes the world’s best tacos!” Who doesn’t want the world’s best tacos? Khushbu Shah is a senior food editor at Thrillist and really loves goat milk ice cream. Follow her ice cream eating on Instagram @khushandoj.